The last stop on our summer con tour is here: PAX Prime! 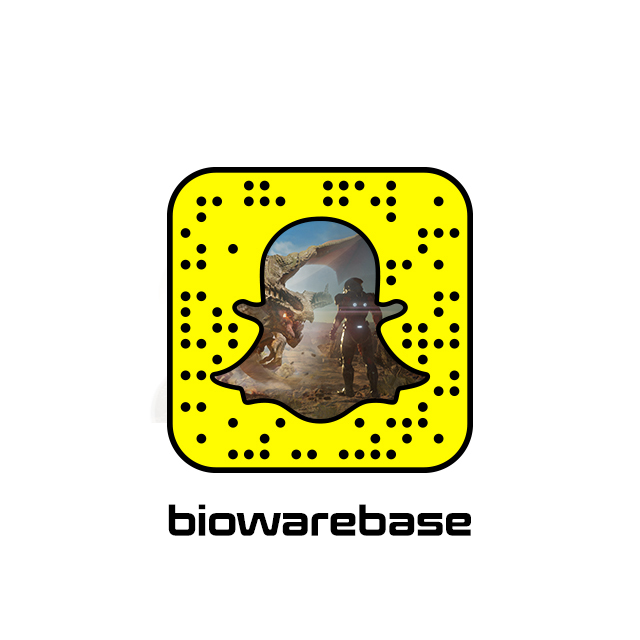 We’ve fueled the BioWare Base and are excited to land in Seattle with plenty of activities to take part in. Join us in room 2AB, where we’ll be hosting Inquisition developer signings, a huge variety of Q&A sessions, a cosplay parade, and game station with Inquisition and Mass Effect 3 for you to play. On Saturday, see the very best of BioWare merch with a fashion show featuring Mass Effect and Dragon Age swag. From hoodies to hats, we’ve got something for everyone. Most importantly, don’t forget to come to our main stage panel on Saturday, where we’ll give you a special sneak peek of what’s to come in the Dragon Age universe. They will be sending out live updates via the following, so stay tuned: Twitter Instagram Snapchat. The Dragon Age: Inquisition announcement on Saturday at 4:30pm PST will be streamed here. 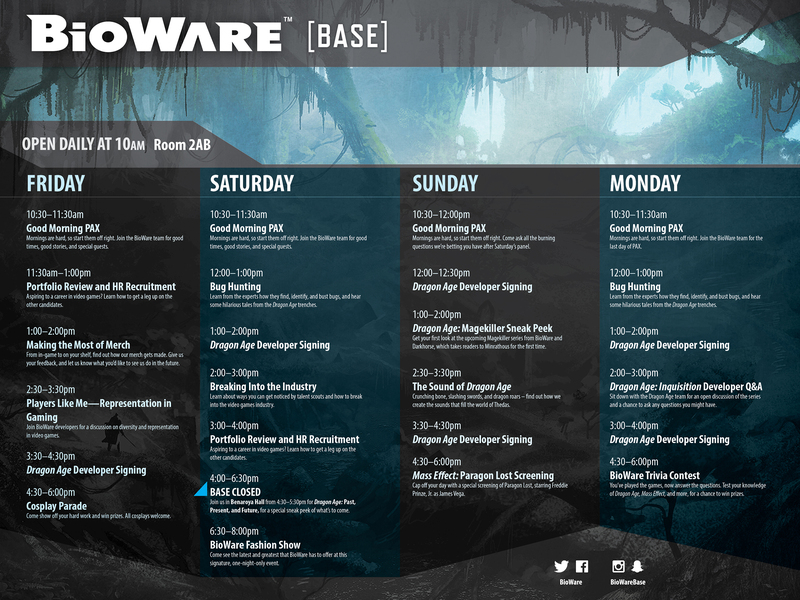 You can also download BioWare's PAX Prime schedule. 10:30–11:30am Good Morning PAX: Mornings are hard, so start them off right. Join the BioWare team for good times, good stories, and special guests. Bring your coffee and questions, because this one’s worth getting out of bed for. 11:30am–1:00pm Portfolio Review and HR Recruitment: Aspiring to a career in video games? Come have your work reviewed by some of BioWare’s talented artists. Also meet with members of our HR team, who will let you know how to get a leg up on the other candidates. 1:00–2:00pm Making the Most of Merch: From in-game to on your shelf, find out how our merch gets made. Give us your feedback, and let us know what you’d like to see us do in the future. 2:30–3:30pm Players Like Me – Representation in Gaming: Join BioWare developers for a discussion on diversity and representation in video games. 4:30–6:00pm Cosplay Parade: Come show off your hard work and win prizes. All cosplays welcome. 12:00–1:00pm Bug Hunting: Dive into the weird, wacky, and wonderful world of game development. Learn from the experts how they find, identify, and bust bugs, and hear some hilarious tales from the Dragon Age trenches. 2:00–3:00pm Breaking Into the Industry: You’ve been to school (or maybe you haven’t). Now what? Learn more about ways you can get noticed by talent scouts and how to break into the video games industry. 3:00–4:00pm Portfolio Review and HR Recruitment: Aspiring to a career in video games? Come have your work reviewed by some of BioWare’s talented artists. Also meet with members of our HR team, who will let you know how to get a leg up on the other candidates. 6:30–8:00pm BioWare Fashion Show: Come see the latest and greatest that BioWare has to offer at this signature, one-night-only event. From geek chic to snuggly onesies, this show has something for everyone. 10:30am–12:00pm Good Morning PAX: Mornings are hard, so start them off right. Come ask all the burning questions we’re betting you have after Saturday’s panel. 1:00–2:00pm Dragon Age Magekiller Sneak Peek: Get your first look at the upcoming Magekillerseries from BioWare and Darkhorse, which takes readers to Minrathus for the first time. 2:30–3:30pm The Sound of Dragon Age: Crunching bone, slashing swords, and dragon roars – find out how we create the sounds that fill the world of Thedas. 4:30–6:00pm Mass Effect: Paragon Lost Screening: Cap off your day with a special screening of Paragon Lost, starring Freddie Prinze, Jr. as James Vega. 10:30–11:30am Good Morning PAX: Mornings are hard, so start them off right. Join the BioWare team and special guest Allegra Clark for the last day of PAX. 2:00–3:00pm Dragon Age: Inquisition Developer Q&A: Sit down with the Dragon Age team for an open discussion of the series and a chance to ask any questions you might have. 4:30—6:00pm BioWare Trivia Contest: You’ve played the games, now answer the questions. Test your knowledge of Dragon Age, Mass Effect, and more, for a chance to win prizes.